With Adobe’s Creative Cloud Photography program—you get Photoshop and Lightroom (along with a slew of Creative Cloud benefits) for $10 a month—this level of pixel-pushing power has never been more affordable. Photoshop’s improved graphics engine cause the Smart Sharpen filter and upsampling via the Image Size dialog box to be a little zippier. All Content-Aware tools are capable of better color blending, too, especially when used in gradients (think skies, water, etc.). So, instead of adaptation presets for the Patch and Content-Aware Move tools, there’s a Structure and a Color field that let you enter precise settings for more realistic blending. Unfortunately, both fields are tucked inside a sub-menu in the Options bar so they’re easily missed (plus the numeric range of what you can enter into either field should be noted in the tooltip). On the other hand, the Fill command’s Content-Aware option sports a Color Adaptation checkbox for better blending, though (oddly) you have to turn it on. Smart Guides are automatically turned on in Photoshop CC 2014. With the Move or Path Selection tool active you can see distance measurements between the active layer’s content and what your cursor is pointing at, including other layer content and the document’s edge. By Option-dragging layer content, you duplicate the layer and see the distance between the duplicate and original as you drag. The new and improved Smart Guides display helpful spacing info about your document’s content depending on where you point your cursor (circled). 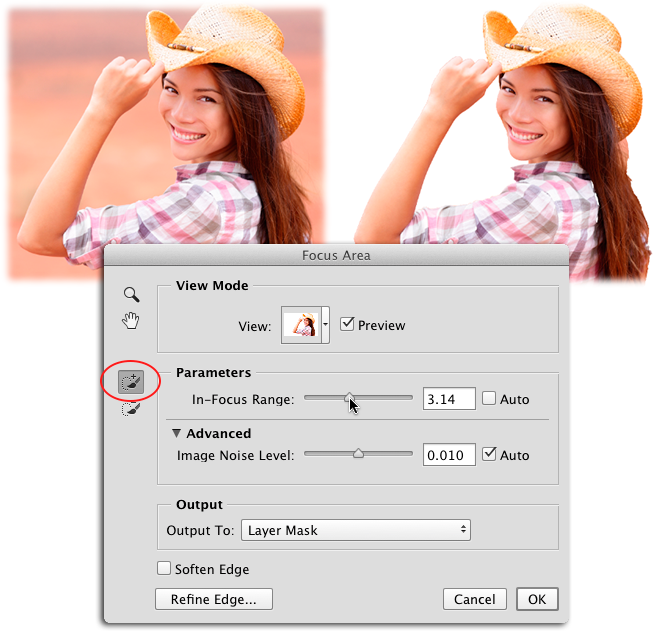 The new Focus Area command automatically selects the in-focus parts of an image. It does a fantastic job on photos that have a strong focal point and blurry background, though its dialog box sports a couple of sliders and brushes that let you fine-tune the selection, along with a button that sends the selection to the Refine Edge dialog box for more tweaking. By using the Focus Area dialog box’s Add To Brush (circled), you can create a quick, near perfect selection in photos that have a strong foreground and blurry background. New in the Blur Gallery filter family are two offerings that let you simulate motion in a photo that doesn’t have any (or that doesn’t have enough). 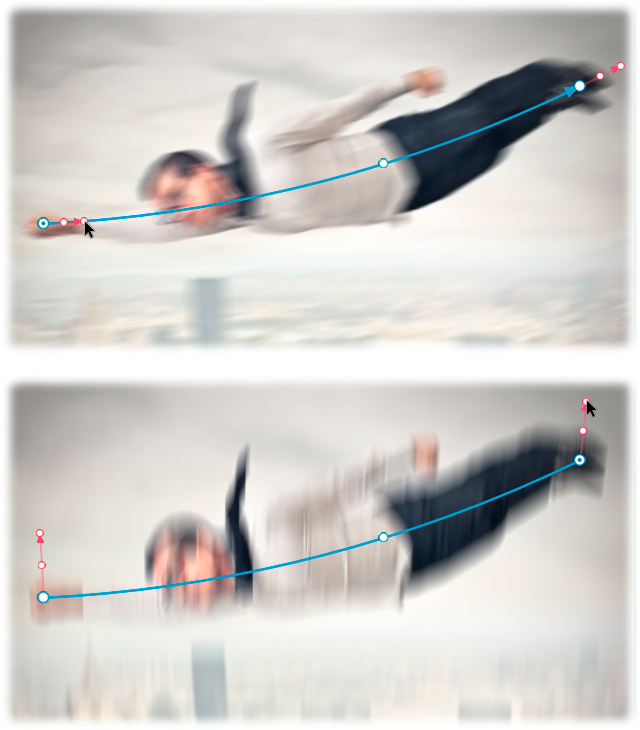 The Path Blur filter lets you create the appearance of motion along a path that you draw (it can be straight or riddled with curves). Fine-tune the blur’s direction, angle, speed, and even how much blurring occurs at the path’s start and end points using a combination of on-image and slider-based controls. The Spin Blur filter lets you put an incredibly realistic spin on an object using a simple set of on-image controls. Happily, both filters work as smart filters. The new Path Blur filter lets you control the direction, angle, and speed of the blur along a path that you draw, enabling you to make an object fly across (top) or fall out of (bottom) the sky. One of the benefits of a Creative Cloud subscription is access to hundreds of fonts via the online service Typekit. In CC 2014, you can access Typekit from the font menu and, once installed, use those fonts in any CC program on your computer. Also new is the ability to search installed fonts by typing part of its name or attribute into the font family menu, and preview the active type layer’s content in another font by pointing at it in the font menu (you don’t even have to highlight the text first). New in an earlier incremental CC release is the ability to link to smart object content instead of embedding it (helpful when combining large files into a single document). In CC 2014, you can convert an embedded smart object into linked or vice-versa. The Properties and Info panels, and the document status bar, keep track of your smart objects, and let you fix broken links (caused by renaming or moving the linked file on your hard drive), as well as update linked content that was changed while the Photoshop document that contains it was closed (if the Photoshop document is open when you change linked content, it’s updated automatically). Finally, the new Package command in CC 2014 copies the Photoshop document and its linked content to a central location for easy delivery to someone else (fonts not included). 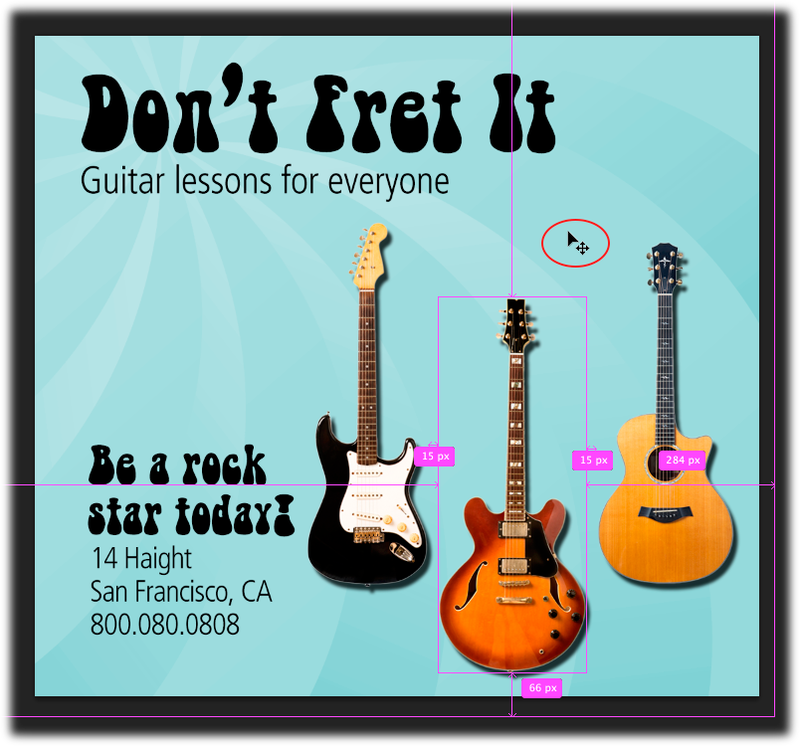 Layer Comps, which let you create multiple versions of an image or design within a single document, were also improved. Photoshop CC 2014 lets you update layer comps by syncing them with the layers you updated (a big timesaver when making global changes to a project), plus you can access a document’s layer comps after placing that document into another Photoshop document as a smart object without opening (editing) the smart object. 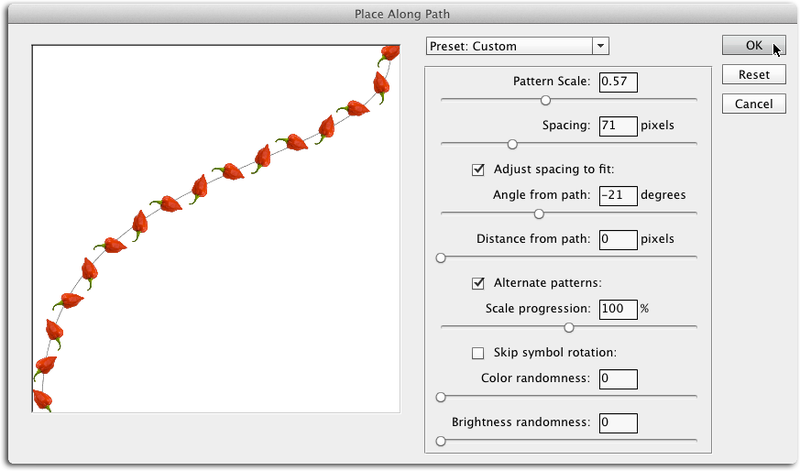 Here a chili-pepper pattern was applied to a path using the Fill command. As you can see, scripted patterns are now easily customizable. 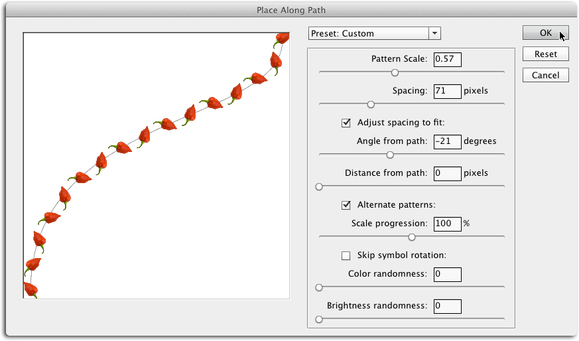 The Perspective Warp command (released in early 2014) lets you change the perspective of a certain area in an image. By drawing a grid atop your image, you can warp that particular area to make buildings and flat surfaces look straight instead of angled. The ability to print 3D objects on a local 3D printer or send your file to a 3D printing service from inside Photoshop was also new in an earlier incremental release, though it was improved in Photoshop CC 2014. The 3D print preview is incredible and shows any areas Photoshop filled in to make the object solid enough to print. If you go the printing-service route, the preview estimates how much the project will cost. Camera Raw’s Graduated and Radial filters are perfect for applying gradual changes to a photo in a linear or circular fashion (respectively), though you can now edit the masks made by both filters using a brush. To the delight of Web designers worldwide, the Generator feature (released in late 2013) lets you instantly export Web graphics by using a specific layer naming convention; new in Photoshop CC 2014 is the ability to export those graphics to a subfolder. Other useful changes include a simplified process for syncing settings to the Creative Cloud, which now includes workspaces, keyboard shortcuts, and menu customizations. Also new in an earlier update is the ability to unlock a background layer by single-clicking its padlock icon (yay! ), see recently used swatches at the top of its panel, and pick a custom background color in the New document dialog box. 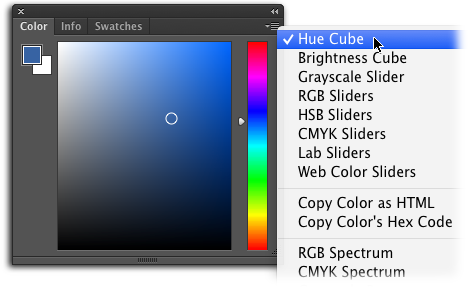 In Photoshop CC 2014, the Color panel’s new Hue Cube mode turns it into a color picker that’s always open, you can create gradients with a single color stop, export 3D color lookup tables for use in Adobe’s pro-level video editing apps, and the layer-based Copy CSS command now understands inner-shadow layer styles. When using the Liquify filter, you can pin the image’s edges down so they don’t get warped and the Brushes panel displays the last 30 brushes you used at the top of its panel (an orange outline also highlights any brush you’ve modified). Last but not least, there’s an Experimental Feature Manager tucked inside Photoshop’s preferences that lets you access “not yet ready for prime time” features that Adobe periodically releases, as well as a checkbox that turns on a narrow Options bar (handy on smaller screens). On the Mac, Photoshop CC 2014’s dialog boxes were redesigned for Apple’s Retina displays, so they’re noticeably shorter and wider (they’re also a darker gray and the buttons are square, making them look more Windows than Mac-like). The Color panel’s Hue Cube mode lets it function as a perpetually open Color Picker, saving you precious clicks. Unfortunately, some useful panels disappeared in Photoshop CC 2014 due to their Flash-based nature. Mini Bridge, Kuler, and Adobe Exchange are all gone, though you can download Kuler as an HTML-based panel from the new Adobe Add-Ons website. Sadly, the Oil Paint filter vanished due to outdated code. Unlike the incremental updates of late 2013 and early 2014, Photoshop CC 2014 is a separate installation, which could be confusing you end up with two copies of Photoshop CC on your computer—just use the Uninstaller program in the older version’s folder to zap it. However, if your workflow depends on a feature that was changed or removed in Photoshop CC 2014—or a plug-in that doesn’t yet work in the new version—you can still use the older version. Since Photoshop CC 2014 is only available by subscription—and it’s a separate installation—there’s no reason not to install it. The productivity enhancements, new selection command, and motion blur filters are big time-savers, plus the ability to edit masks made by Camera Raw’s Graduated and Radial filters is incredibly helpful. If your workflow depends on some of the missing panels (or you adore the Oil Paint filter), there’s no harm in keeping the older version around. And with Adobe’s Creative Cloud Photography program—you get Photoshop and Lightroom (along with a slew of Creative Cloud benefits) for $10 a month—this level of pixel-pushing power has never been more affordable. Even after all these years, Adobe continues to add new features to its venerable image and photo editor that make it easier to get your work done.